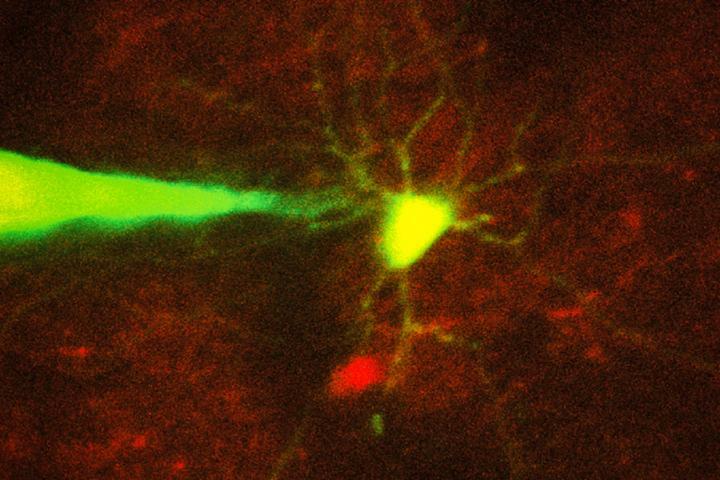 CAMBRIDGE, MA — Recording electrical signals from inside a neuron in the living brain can reveal a great deal of information about that neuron's function and how it coordinates with other cells in the brain. However, performing this kind of recording is extremely difficult, so only a handful of neuroscience labs around the world do it. "Knowing how neurons communicate is fundamental to basic and clinical neuroscience. Our hope is this technology will allow you to look at what's happening inside a cell, in terms of neural computation, or in a disease state," says Ed Boyden, an associate professor of biological engineering and brain and cognitive sciences at MIT, and a member of MIT's Media Lab and McGovern Institute for Brain Research. Boyden is the senior author of the paper, which appears in the Aug. 30 issue of Neuron. The paper's lead author is MIT graduate student Ho-Jun Suk. There are two types of patch clamping: a "blind" (not image-guided) method, which is limited because researchers cannot see where the cells are and can only record from whatever cell the pipette encounters first, and an image-guided version that allows a specific cell to be targeted. Five years ago, Boyden and colleagues at MIT and Georgia Tech, including co-author Craig Forest, devised a way to automate the blind version of patch clamping. They created a computer algorithm that could guide the pipette to a cell based on measurements of a property called electrical impedance — which reflects how difficult it is for electricity to flow out of the pipette. If there are no cells around, electricity flows and impedance is low. When the tip hits a cell, electricity can't flow as well and impedance goes up. Once the pipette detects a cell, it can stop moving instantly, preventing it from poking through the membrane. A vacuum pump then applies suction to form a seal with the cell's membrane. Then, the electrode can break through the membrane to record the cell's internal electrical activity. "It might be a cell that is compromised in autism, or is altered in schizophrenia, or a cell that is active when a memory is stored. That's the cell that you want to know about," he says. "You don't want to patch a thousand cells until you find the one that is interesting." "It's almost like trying to hit a moving target inside the brain, which is a delicate tissue," Suk says. "For machines it's easier because they can keep track of where the cell is, they can automatically move the focus of the microscope, and they can automatically move the pipette." This technology paves the way for in-depth studies of the behavior of specific neurons, which could shed light on both their normal functions and how they go awry in diseases such as Alzheimer's or schizophrenia. For example, the interneurons that the researchers studied in this paper have been previously linked with Alzheimer's. In a recent study of mice, led by Li-Huei Tsai, director of MIT's Picower Institute for Learning and Memory, and conducted in collaboration with Boyden, it was reported that inducing a specific frequency of brain wave oscillation in interneurons in the hippocampus could help to clear amyloid plaques similar to those found in Alzheimer's patients. "You really would love to know what's happening in those cells," Boyden says. "Are they signaling to specific downstream cells, which then contribute to the therapeutic result? The brain is a circuit, and to understand how a circuit works, you have to be able to monitor the components of the circuit while they are in action." Other co-authors include Ingrid van Welie, Suhasa Kodandaramaiah, and Brian Allen. The research was funded by Jeremy and Joyce Wertheimer, the National Institutes of Health (including the NIH Single Cell Initiative and the NIH Director's Pioneer Award), the HHMI-Simons Faculty Scholars Program, and the New York Stem Cell Foundation-Robertson Award.